Me and the sweety have been on a low-cal, low-fat, low-cholesterol diet for a while now. We have been doing so well but the other night while waiting on American Idol to come on, we were both craving something; and by something I mean something with calories, fat, and cholesterol!! My sweety was staring into the refrigerator longingly and I was contemplating any and every thing in the cupboards. She wanted chocolate cake of course and I wanted chips, my favorite! But we had cleaned the house of any of the things that could sabotage us...or so we thought! Out of the corner of my eye, I spotted a half empty box of pancake mix!! Oh happy day! I yelled out, "I want pancakes!" while holding the box above my head and doing a happy dance. "Yes", she cried, "pancakes!" Then the guilt set in! "Oh honey, we can't have pancakes. You have to go back to the doctor and i need to take care of you and ....."
"But I want pancakes now" she pouted, "you said it and you made me want it." So I said, 'Yes baby, I will fix you the pancakes!" "Oh thank you" she said, "thank you, thank you, thank you!" "Anything for you honey" I replied, eyeing the picture on the box hungrily. So cook pancakes I did! 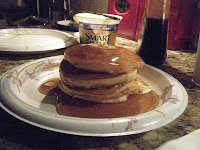 I fixed a big stack of them and set them out on the plates, poured the skim milk for my sweety..she IS still watching her cholesterol afte r all...and served them to her with a flourish. She took a bite of her stack of delicious, calorie laden pancakes, looked at me with love in her eyes and said, "Damn baby, I just fell in love with you all over again!" Can't I just be me? Where is my "toaster oven" dammit?